The dozen tables are glass topped and dressed in pink linen. The walls are robin egg blue. Hung Sum is a small, plain room that bears the bumps and bruises of a hard-working space. 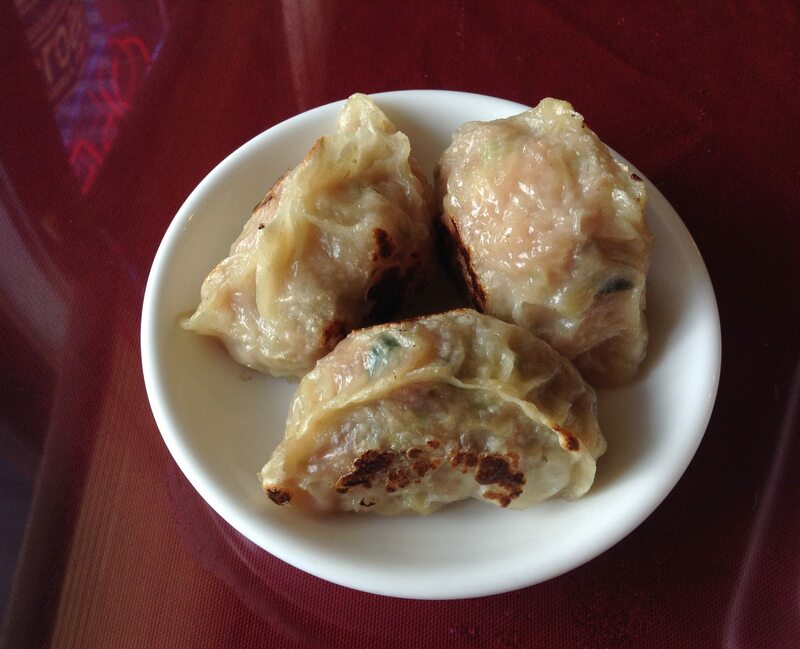 But we aren’t here for the ambience, we’re here for dim sum, and nobody does it better. At least not in this town. Do you make all the dim sum yourselves? ‘What do you mean?’ she asks me. I mean that other places buy a lot ready made, from places like T&T. I’ve had some trouble finding out her name. She has told me, but she’s always been far too busy to spell it for me. And I’m scared of messing it up. Her husband is in the kitchen. I’ve never seen him. In fact I’ve never seen anyone else in the room, though I’m told she has a helper on weekends. Mostly, it seems, the Hung Sum team of two is small and mighty. Don’t come expecting trolleys. The place is simply too small and the commitment to making dim sum to order too strong. Baskets arrive steaming hot and the product very fresh. And who wants trolleys anyway? The trouble with rolling dim sum is that the food is made ahead of time, and as it promenades the tables, the lids are removed to show off the wares (particularly for those of us who buy with our eyes) and steam escapes with every viewing. The hope is that it will all sell. But if it doesn’t the first go-round, back it goes to the kitchen to get re-steamed. Then out it goes again, its second or third foray. You can taste the weariness. So what’s on offer and what’s good? 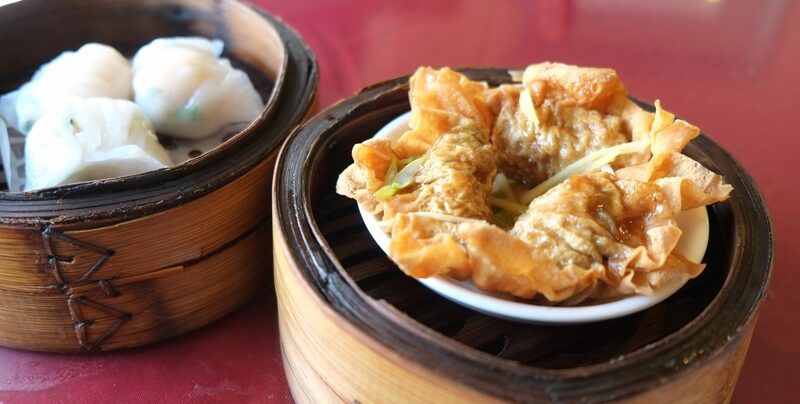 Chinese eggplant sandwiched with whole chunks of shrimp; the open-topped siu mai, pork or shrimp; green onion-beef dumplings, fried, then bathed in ginger. Freshly steamed rice noodles are folded over a filling of sweet pork. 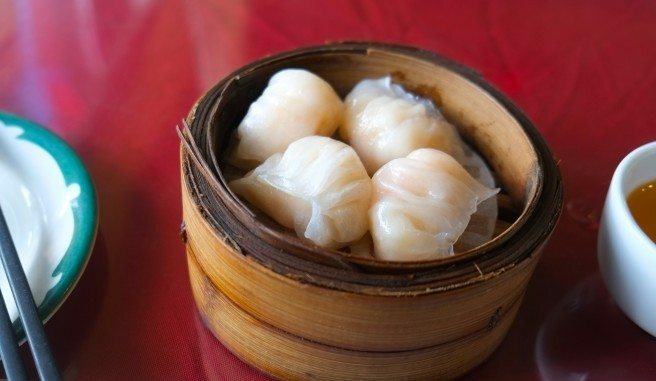 The shiny har gau — snappy shrimp chunks with scallion packaged up in a translucent, stretchy wheat skin — are slightly chewy but never tough. Soft and sweet yeast buns are stuffed with barbecued pork. Chiu-Chow style sweet pork is mixed with chives and cilantro and crunchy peanuts, delicately pleated. So-called turnip cakes are made with daikon radish, flavoured with ham and shrimp, pressed and fried, cut into squares. Chopped squid arrives paddling in a lightly thickened ginger-garlic broth. 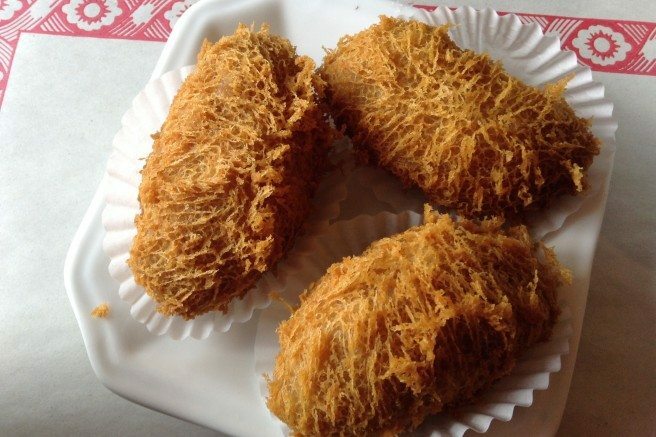 Wispy taro dumplings look a bit prehistoric on the outside — hairy, crispy-brown, egg-shaped — and once you take a bite, inside is softly purple, with a core of cubed pork. For some green relief, we order a platter of steamed al dente Chinese broccoli, and for a sweet ending, egg custard tarts with a shattering crust. This is dim sum that doesn’t evoke much wow factor, but is very fresh, steaming hot, and nicely seasoned — juicy little affordable bites, served by hard-working people in a hard-working room. Open Monday to Friday, 11 a.m. to 8 p.m., weekends, 10 a.m. to 8 p.m.